It was the wonderful people of Roller Derby that made it so successful over the years….hardly a profound statement, but true. Of course there were Charlie O’Connell, Joan Weston, Ann Calvello, Bert Wall, Ken Monte, Margie Laszlo, and dozens more, but the one I always considered my personal protege was Cliff. Cliff was born a natural athlete. He first came around Derby when he was just 15, and although he grabbed the game almost immediately, we couldn’t have him start skating professionally until he was 16. And we couldn’t use his real last name Avery because of complications, so he used his other family name Butler. He first skated on the Hawaiian team, then moved over to Ken Monte’s team, the Cardinals. And under Ken, who skated a rough powerful game, he was able to develop his own style. What was amazing was his body control; I don’t think anyone could use a jump block, utilizing his hip, as Cliff did. He eventually moved over to the San Francisco Bay Bombers and became the super star that were the results of his natural ability. And stars are what drew people to our game. And eventually he received an offer to become coach (at 21 plus+) for the Ohio Jolters, with Ann Calvello as woman captain, and his legend continued to grow. When Derby shut down in 1973 Cliff finished his college education and was employed at the GM/Toyota plant in Fremont California. He then was hired by US Air and moved to Santa Barbara and just this past year retired from work. Cliff does not stand still. He was, and is, a great trainer of skaters and creator of game strategy, and he started hopping to Colorado, Oregon, Arizona, to utilize his unique talents, and his latest stop was in Killeen Texas, where he trained the brand new league, helped Jerra Bullock and the league promote and sell out their first game ever just a week ago (using Brown Paper Tickets of course), and they won against a far more experienced team with a fast and furious style of skating.. So now Cliff is being overwhelmed with requests for boot camps; he next will work with Mark Quad Damage on training the juniors in Tucson then on to other locations. And I am here to “pimp” my son; contact him on Facebook and arrange a boot camp. It will be different from anyone else, and you will learn techniques that have come down for 50 years and are so relevant today. And those who have been trained love him: ask Jerra Bullock or any of the others. And those who can’t book him, don’t forget about John Hall, another veteran of Roller Derby who has given his knowledge and expertise to the San Diego team. And Cliff knows how to build the traditional official Roller Derby Banked track, suspended on Dexy steel (not pipe) which can be set up by 8 people in less than three hours, and dismantled by the same crew in 1 and 1/2 hours. And honestly, skating the banked track is a whole different experience. So go to his facebook page, just tell him Dad sent you, and it will make your Derby days so much better! 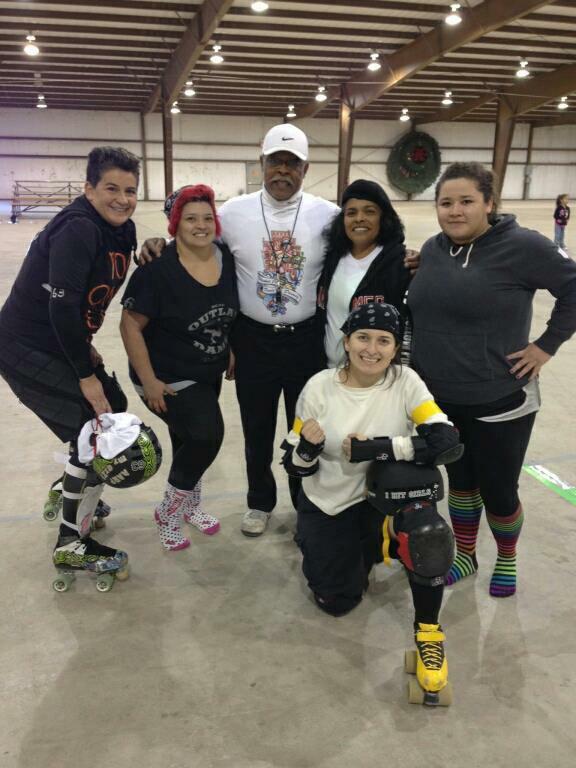 And of course Cliff believes strongly in the empowerment of Derby participants. You will never regret it.